Before & After Coconut Oil Application! May is Skin Cancer Awareness Month, which should really make us reflect on how important it is to protect ourselves from prolonged sun exposure. Living in Florida, this is something that I deal with on a daily basis, especially on the weekends when at the beach or taking outdoor trips. About 3 weeks ago, I was out fishing for the day and did wear a good SPF 50 sunblock; however I did miss a spot on my arm and shoulder. Needless to say, I was left with a pretty bad sunburn that was lobster red – yikes! I’m a big advocate of applying coconut oil onto my sunburns and can personally say that this works wonders. Coconut oil is known for its anti-inflammatory properties, which helps an extreme amount when applied to the affected area. 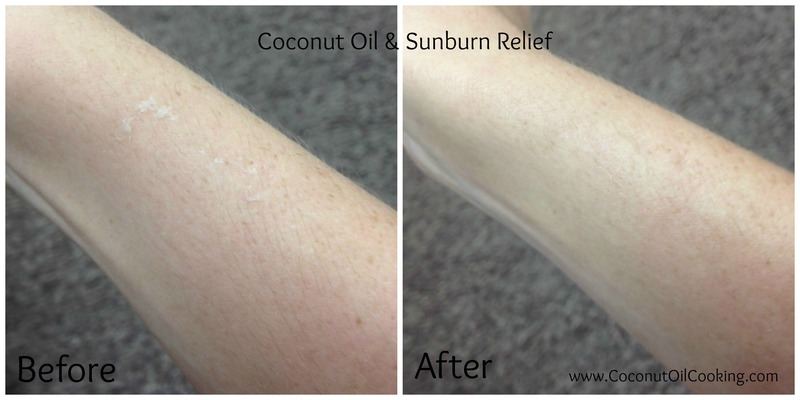 Not only does coconut oil help the inflammation of sunburn, it also helps moisturize. 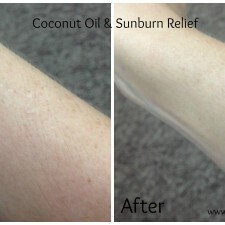 You can apply a desired amount of coconut oil to your sunburn each hour for relief from dryness and inflammation. For added relief, try this coconut oil and Aloe Vera mixture, which is a great cooling agent when placed in the refrigerator! Now we all know that with sunburn comes the next dreaded part – skin peeling. Oh my, I can’t begin to tell you how much I despise this natural way of life. Of course no one wants to look like a shedding snake! Even with tons of lotion, nothing would stop my skin from peeling. This time around, I applied coconut oil to the part of my skin that was peeling and believe it or not, it helped SO much! Simply take a generous amount of coconut oil to the affected area and rub into the skin. You may experience some of the skin coming off with the coconut oil, but this is completely normal. I had a good amount of the peeling stop by doing this, but did make sure to continue every hour or so as needed. I hope that these tips may help if you’re in search of sunburn relief. For more information Skin Cancer Awareness Month, visit the Skin Cancer Foundation website. Try making your own homemade sunscreen that contains coconut oil and zinc oxide this summer and be sure to cover up! Coconut oil by itself has a natural SPF of 4-6. Just be sure to take this into consideration when applying it in the sun.